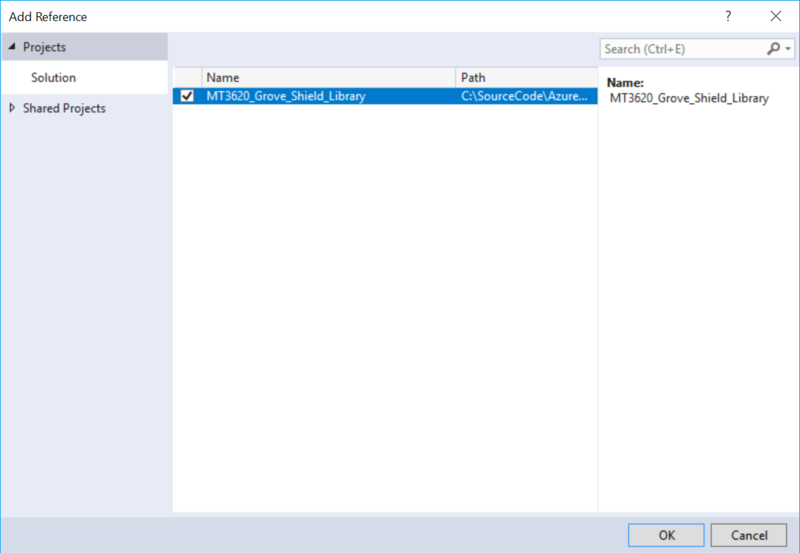 When first diving in to explore the Azure Sphere MCU, I was a bit dismayed that I2C and ADC are currently unsupported. My spirits were then lifted when I discovered that the Grove Shield for the Azure Sphere MT3620 removes that barrier! When I first purchased my Azure Sphere, I also added the Azure Sphere Grove Starter Kit. I have had a lot of good experiences with Seeed Grove kits in the past, so picking this one up was only logical. It provides the shield that sits atop of the Azure Sphere and exposes plug and play options for GPIO, Analog, and UART peripherals. The starter kit also shipped with a series of popular sensors so that you can get started designing your devices without having to breadboard or solder anything. There are tons of affordable Grove sensors available, each with accompanying schematics and source libraries for various hardware platforms. Seeed Studio has provided full C source code to their library that interfaces with the Azure Sphere board. In the same repository, they’ve also included code samples for each of the Grove sensors provided in the starter kit. 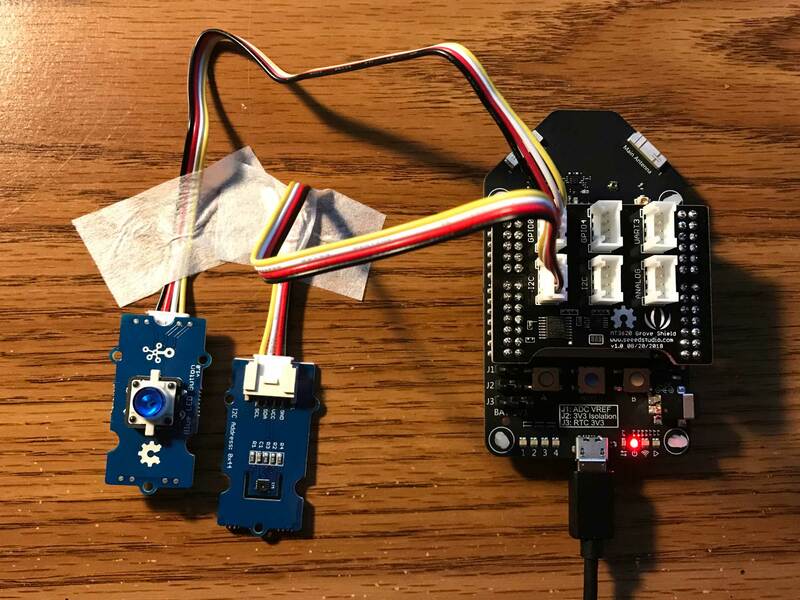 In this project, we’ll be using two groves that come from the starter kit – the Grove – Blue LED Button and the Grove – Temperature and Humidity Sensor (SHT31). Plug the Temperature/Humidity sensor into one of the I2C ports, and the button into the GPIO0 slot (this ultimately ends up using GPIO0 and GPIO1). The first step to any development is to clone the MT3620 Shield Library repository. Remember where you cloned this repository – we’ll be needing it shortly! 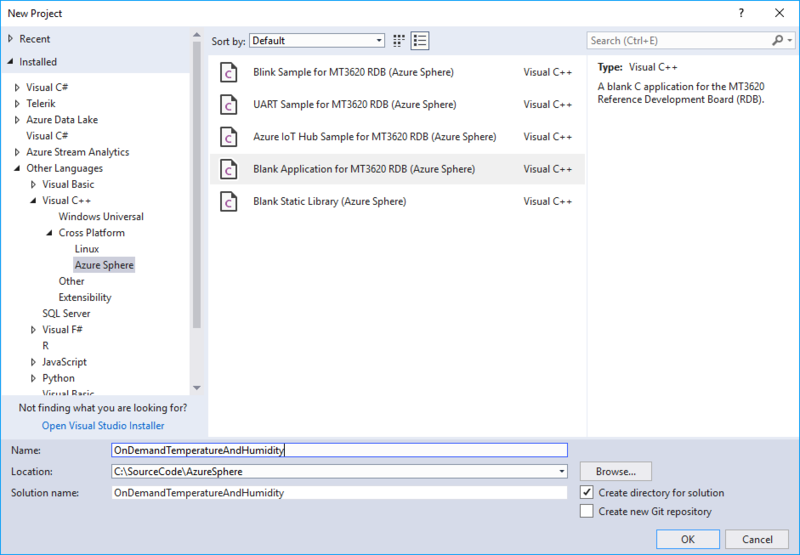 Once cloned, open Visual Studio 2017, and create a new project using the ‘Blank Application for MT3620 RDB (Azure Sphere)’ template (located in Other Languages -> Visual C++ -> Cross Platform -> Azure Sphere). I have named mine ‘OnDemandTemperatureAndHumidity’. Once the project has been generated, we need to add the cloned MT3620 Shield Library project to the solution. Do so by right-clicking the solution in solution explorer, and select ‘Add existing project’, then find the ‘MT3620_Grove_Shield_Library.vcxproj’ that is located in the MT3620_Grove_Shield_Library folder of the cloned repository. Next, add a project reference to the Grove Shield Library project that we just added. Do so by right-clicking on your ‘OnDemandTemperatureAndHumidity’ project, and select ‘Add’ -> ‘Reference’, then select ‘Projects’ -> ‘Solution’ in the left-hand treeview, and place a checkmark next to the MT3620_Grove_Shield_Library item. Bring on the Source Code! 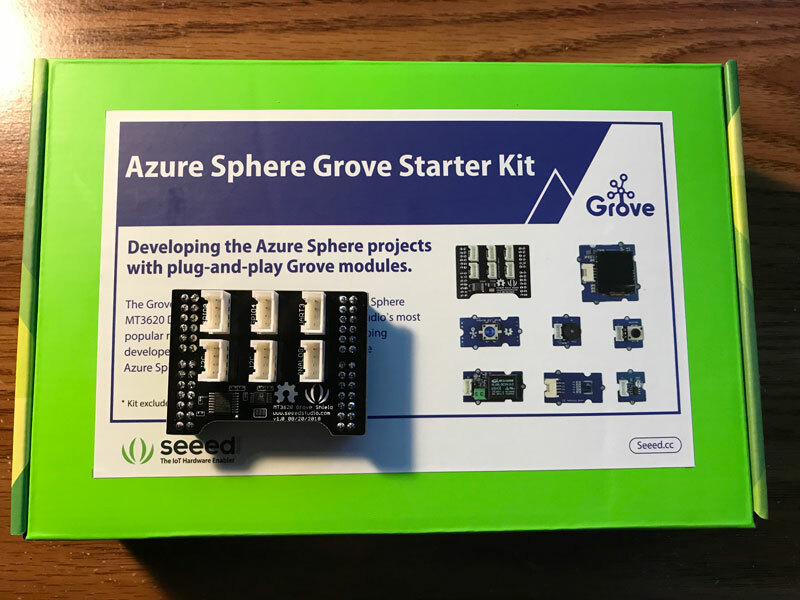 The Azure Sphere Grove Starter kit greatly simplifies creating a proof of concept on the platform. What is especially nice is that the libraries provided by Seeed Studio have all the source code available on GitHub. This makes it easy to start creating code to interface with additional Groves, or if you are adventurous, creating your own custom Groves adhering to the interface. 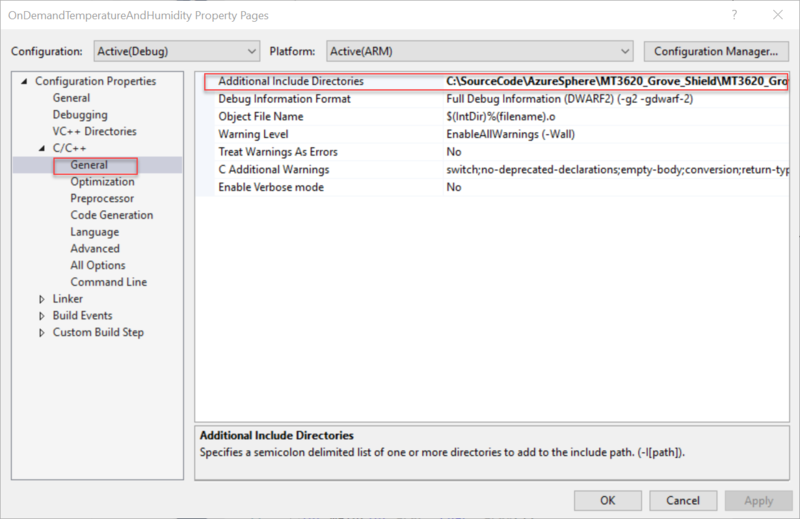 I don’t think it is – the connection is in an app_manifest.json as being allowable, but there isn’t an actual app in the library – it looks like it may be left over from some type of early development. The app_manifest.json that is used is the one that resides in the same project as the main. I took a quick look around and don’t see anywhere it is calling out to an external resource. It may be good to submit a question on their GitHub 🙂 – good catch though – I hadn’t noticed that! Have done, also read their readme (and re-read your article) and see that the process for including their library is by compiling from source code. Hence you can be fairly certain what you are putting on the board.